Read the Aston Martin DB9 Volante convertible (2004 - 2012) car review by Auto Trader's motoring experts, covering price, specification, running costs, practicality, safety and how it drives. Open-topped version of Aston Martin’s glorious DB9 loses little, but gains a dash of sun-soaked glamour. Interested in buying an Aston Martin DB9? Does lopping the roof off a car automatically add a bit more glamour? When the car’s as beautiful as the Aston Martin DB9 that’s debatable and certainly with the roof up the DB9 Volante convertible lacks the cohesion of the coupé’s styling. Drop its multi-layered fabric roof – at the touch of a button – and the DB9 Volante is transformed. It looks sensational, the loss of the roof only accentuating the DB9’s lithe lines. As with the coupé the fine detailing is beautiful, from the very tip of the front grille to the bright exhaust pipes at the rear. Aston Martin prides itself in its hand-crafted interiors and here it’s all on show. Bathed in sunlight the interior looks even better, though some of the more polished finishes do result in a good bit of dazzle – all the better reason to always wear sunglasses. The leatherwork is neat and the main controls all usefully positioned, but Aston Martin’s stereo and sat-nav system integration isn’t out of the first chapter of the rules of ergonomics and ease of use. It all works with familiarity, but gaining that familiarity takes a while. Like its coupe sibling a pair of seats sits behind the driver and passenger. Access to them is improved with the roof down but it’s still not somewhere that you’d want to spend more than a few minutes – from the restaurant to the super yacht in Cannes is about as far as you’d want to go. Roof up the cabin does feel a bit more claustrophobic; roof down the boot space is less – leave the roof raised and the difference in boot capacity is about that of a large Mulberry bag. Aston has packaged the DB9 Volante impressively. Revisions in 2010 brought not just some minor styling tweaks, but the standard fitment of Aston Martin’s adaptive damping system. The result is a DB9 that better manages the balance between ride comfort and control – even when it’s fitted to the less torsionally rigid, open-topped Volante. Not quite as sharp to drive as its coupé relative (thanks to the loss of its roof), it’s still a deeply impressive all-rounder, with fine balance, high levels of grip and traction and light, accurate steering. Despite a 55kg weight penalty over the coupé Aston quotes the same 4.8-second 0-62mph time for the Volante. That’s whether you opt for the manual or the smooth-shifting automatic. Do the latter, as it better suits the DB9’s demeanour, which, although offering 470bhp from its 6.0-litre V12, is that of an easy, rapid grand tourer. It really suits open, flowing roads with a great view. Find some space, and the DB9 Volante will still prove devastatingly rapid and enjoyable, as you’d expect in a car with such a mighty engine under its long nose. Running costs are a scant consideration when you’re laying out so much money for a car. The DB9 Volante will be expensive to run, not least because it delivers an official combined fuel economy figure of between 17-19mpg depending on the transmission. You’re unlikely to get that either, with a day-to-day average certain to be in the early teens. Use all its ample performance and it’ll be worse. Servicing will be expensive, as will insurance and road tax, but you’re unlikely to worry about it if you’ve bought it in the first place. Aston Martin’s reputation for reliability wasn’t among the best, but it has certainly improved in recent years. That the DB9 is no longer in the first flourish of youth helps, with most of the early teething issues addressed. Watch out for a sticking roof, which isn’t only annoying, but rather embarrassing. As with all exotics the best advice for trouble free motoring seems to be to use it regularly, as this sees off the battery-draining, fluid-seeping, air-leaking issues that unused cars – and we’re not just talking Astons here – suffer from. Featuring all the airbags and electronic stability systems of its coupé sister, the Volante benefits from the addition of pop-up roll-over hoops deployed from the headrests in an accident. The DB9’s lightweight and strong aluminium structure helps provide excellent crash protection, and Aston Martin used Volvo’s expertise and crash test facilities when developing the car. All the luxury you’d expect in included, with a hand-crafted interior finished beautifully in leather, brushed metal and polished wood. What the DB9 Volante is missing is some of the more sophisticated electronics from rivals like lane-departure assist systems, driver alertness monitoring and radar monitored variable cruise control. Thing is, if you’ve never had them in the first place you’ll not miss them here, the DB9 actually better for it. What’s not forgivable is the ancient sat-nav, which should hopefully be replaced by the infinitely better system from the Virage soon. 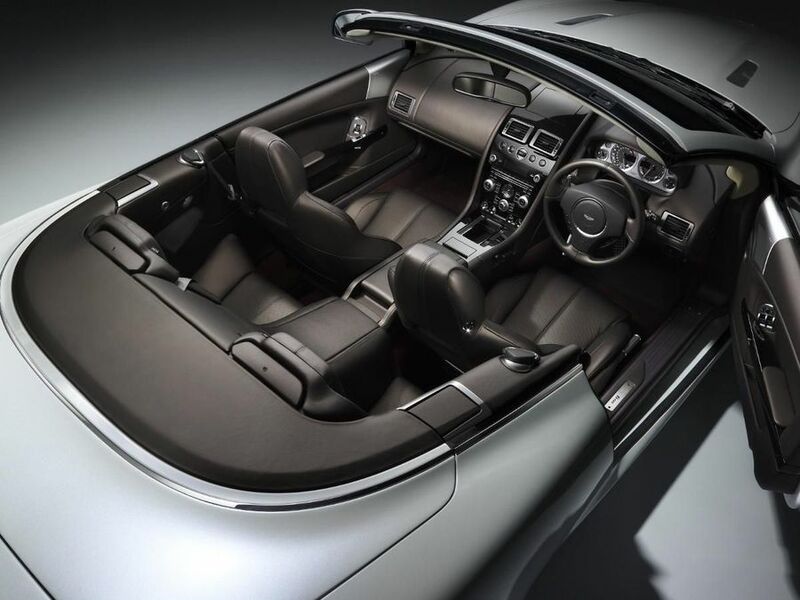 You’re either a coupé or a convertible buyer, and the Volante ticks all the boxes for those who enjoy the sun. A glorious sounding V12 engine, a stunning body, a fine drive and a hand-finished interior – the DB9 Volante has it all. The only issue is the availability of the Virage, which has more power, more equipment, greater agility and more contemporary, chiselled looks. It’s not much more money either, which does rather leave the DB9 Volante looking like a model that’s on its way out – despite its impressive abilities.